It's been a while since we've last updated this blog so yeah, here's some updates on what's going on. Haha! 2013 was a volatile year for Philippines and the EM in general. The PCOMP started out 2013 quite strongly in the 1st 5 months of the year only to wipe out all the gains accumulated in just roughly a month time from mid-May to end of July. 2013 was a roller coaster ride w/c ended up relatively flat at 1.33% gain, on the other hand, for 2014 the PCOMP is coming back with a 6.87% YTD gain. Let's see what happens moving forward. Apparently the performance of our stock portfolio for 2013 to present is somewhat crappy, we've only made 0.83% for the whole 2013 and is currently at -1.89% for the year 2014. This vs the PCOMP's 1.33% (2013) and 6.87% (YTD 2014) and S&P 500's 31.30% (2013) and -0.69% (2014). However, looking back since Inception (~4 year time frame) we still outperformed the two benchmarks with a relatively decent spread of w/c we were able to achieve a Compounded Annual Growth Rate (CAGR) of 24.94%. As an investor who takes money management seriously (and very passionately at the same time haha) the 24.94% CAGR is not really bad, the challenge on my end now is to keep the CAGR at that level or push it even higher. *In computing the Portfolio performance, everytime we add additional capital to the portfolio the accounting treatment is as if the cash was added at the start of the fiscal year. We believe there's a more accurate way of computing the performance than this method but we're sticking to it because it is simple, it's conservative and it makes intuitive sense. *Data points of the chart above are Yearly, hence daily and monthly draw-downs are not visible. But that's fine, we're still holding to it anyway as the investment case on each of our positions remains valid. Positions on LRI & FOOD were just recently executed. As I don't have much cash lying around what I did was I sold all my FAMI Equity Fund shares (accumulated since 2010) on the 1st week of February 2014 and used the cash to buy FOOD & LRI. I haven't fully used the proceeds from the FAMI Equity Fund liquidation yet but I'll be putting them to use in the next few months. Below is the table of purchases of FAMI Equity Funds shares and selling price. Bye for now FAMI Equity Fund, I'll try to put the proceeds of your sale to good use. Haha! 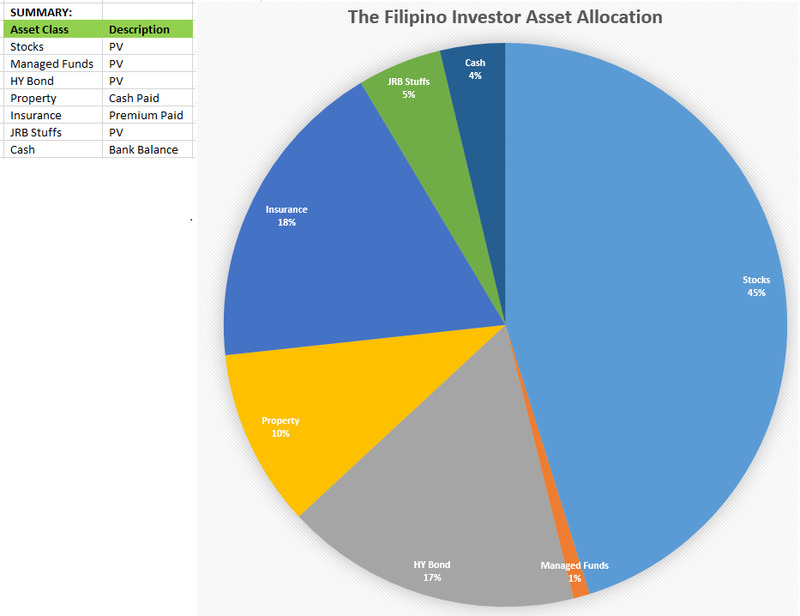 So with that, this is how our total investment portfolio looks like now. The JRB stuffs you're seeing are ventures w/ my friends. The Managed Fund is the FAMI Balanced Fund - I kept this so I can still attend their Annual Stock Holders Meeting. Haha :D Insurance are the policies from Insular Life & St Peter. HY Bond is a debt deal I've made w/ an entrepreneur - valued at 15% discount rate of cash receivables from debt payment. Stocks, is of course the stock portfolio you already saw above. My Insurance exposure is too high. I think Insurance exposure should be at least 7% of my total portfolio. To fix there are two ways, to grow my current portfolio of stocks & other ventures or to save more and inject some cash to dilute the insurance exposure. I guess I will be doing both. Have an offshore broker/exposure to other markets. Hmm.. I guess that would be it. Till next time!